LÄRABARs is a brand of health food bars and snacks known for containing nothing but simple, wholesome ingredients in an unprocessed form. LÄRABAR is a snack bar brand that promises to provide you with a range of healthy treats that are meant to satisfy a sweet tooth and keep you satiated between meals. The bars are branded as gluten-free fruit-and-nut blends that contain just a handful of ingredients each. According to their website, Colorado native Lara Merriken founded LÄRABAR in 2001 when she struggled to find snack options that combined simple, wholesome ingredients with convenience. Though the brand was acquired by the Natural and Organic Division of General Mills in 2008, the product website states that LÄRABAR remains committed to its founder’s original goals for healthy snacks. The bar’s branding makes it clear that the company prioritizes the perception of health for their products. Each LÄRABAR is advertised as vegan, GMO-free, dairy-free, soy-free, gluten-free, and free of artificial ingredients and added sugars. The company also states that they only source Fair-Trade cocoa and coffee beans and that their packaging is recyclable. Let’s look closer at what’s really inside each bar and how they stack up to the competition to see whether you should add LÄRABARs to your shopping list. What Kinds of LARABAR Products are Available? LÄRABAR: The brand’s original fruit-and-nut bar is a gluten-free blend of unsweetened fruits, nuts, and spices. Popular flavors include apple pie, cinnamon roll, mint-chip brownie, peanut butter banana, and snickerdoodle. LÄRABAR Bites and Truffles: These truffle-sized chocolate snacks are meant to satisfy your craving for sweets while remaining gluten-free, non-GMO, vegan and dairy-free. The brand offers ten flavors, including caramel sea salt, cherry chocolate chip, mint chocolate truffle, and chocolate peanut butter. LÄRABAR Fruits and Greens: Each bar contains just five ingredients, including a ¼ cup of nutrient-rich greens. The three flavor options are strawberry spinach cashew, pineapple kale cashew, and blueberry spinach cashew. LÄRABAR Nut and Seed: Baked and crunchy, these bars are made with nutrient-dense ingredients like sprouted chia seeds. Some featured flavors are peanut chocolate, maple cinnamon, honey almond cranberry, and dark chocolate almond. LÄRABAR Organic with Superfoods: Each superfood bar provides you with a blend of fruits, nuts, and nutrient-dense ingredients like kale, cacao nibs, hemp seeds, and turmeric. Each bar is certified USDA Organic, and flavors include blueberry lavender hemp, hazelnut hemp cacao, coconut kale cacao, and turmeric ginger beet. LÄRABAR Kid: These bars are designed to satisfy kids’ taste buds while containing fewer than nine ingredients each. The flavors offered are chocolate chip cookie, cinnamon swirl, chocolate brownie, and chocolate mint brownie. What Ingredients Are in LARABAR Products? As mentioned previously, a big part of LÄRABAR’s advertising is that the bars contain just a handful of healthy ingredients that are minimally processed. This means that each product is intended to stay as close to the natural state of its ingredients as possible. Does this match reality? Let’s find out by looking at the ingredients lists for a LÄRABAR product from each category. Within this sampling, no LÄRABAR product contains more than nine ingredients, and everything on this list is a plant-based ingredient (with the exception of honey and sea salt) that you can easily buy in the grocery store. The majority of LÄRABAR products contain dates, which are used both as a sweetener and as a binding agent. Healthline tells us that dates have long been valued in the Middle East for their nutritional value and ability to act as a digestion aid. These sweet fruits also contain up to 18 grams of carbohydrates each, which makes them a quick fuel source for your body. The lack of preservation agents within LÄRABAR products especially noteworthy, and the brand's notes on their product website that they use a secure double-wrapped packaging to give each bar a shelf-life of up to nine months. What should be noted is that a few of these products contain added sugar from sources like semi-sweet chocolate chips, honey, and maple syrup. While these ingredients seem like a healthier alternative, the truth is that they aren’t much better for you nutritionally than table sugar or high fructose corn syrup. According to Livestrong, all added sugars have potential health consequences, regardless of whether they have natural origins. That’s because your body processes all forms of sugar the same way, and the added nutritional benefits of forms like honey and maple syrup are negligible. At 20 grams per serving, the Turmeric, Ginger, and Beet superfood bar contained the most sugar of the products we looked at. The American Heart Association (AHA) recommends that adults should consume fewer than 25-35 grams of sugar a day, which means that eating one LÄRABAR Superfood bar can put you close to the lower limit. Finally, we noticed that LÄRABAR products are significantly lower in protein than some of the health bar competition (more on that later). Most of the brand’s bars seem to average about 4 grams per bar. Where Can You Buy LARABAR? At the time of writing, it’s possible to buy LÄRABARs online from Target and Amazon, and retail locations across the country like Walmart, Target, and Rite Aid. While the prices will vary depending on both the product and the retailer, our research showed that each box of five LÄRABARs tended to cost between $3.50 - $5.29. Returns for LÄRABAR products will depend on the return policy of the company you bought it from but you can contact the company with your specific questions through their contact page. 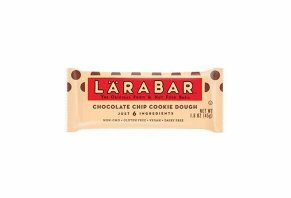 What Bars Are Similar to LARABAR? Ingredients Cashews, dates, semi-sweet chocolate chips, apples, sea salt, vanilla extract Dates, dried egg whites, almonds, cashews, chocolate, natural flavors, sea salt Organic Brown Rice Syrup, Organic Rolled Oats, Soy Protein Isolate, Organic Cane Syrup, Organic Roasted Soybeans, Rice Flour, Cane Sugar, Unsweetened Chocolate, Organic Soy Flour, Organic Oat Fiber, Organic High Oleic Sunflower Oil, Cocoa Butter, Barley Malt Extract, Sea Salt, Natural Flavors, Soy Lecithin, Organic Cinnamon. As this chart makes clear, all three companies will provide you with snack bars of roughly equivalent size, as each one contains between 210-250 calories. However, they differ in their protein and sugar content. Both the chocolate chip flavored Clif Bar and RXBAR have more protein than the LÄRABAR, coming in at three times and four times more respectively. The RXBAR’s almonds and egg whites explain this nutritional boost, and the Clif bar contains owes most of its protein to the soy protein isolate it contains. Likewise, while both the LÄRABAR and RXBAR have between 12-15 grams of sugar per serving, the Clif Bar comes in at close to double this amount at 25 grams per bar. That’s an important consideration, as it’s at the low end of the amount of sugar the American Heart Association suggests you consume in a day. The Clif bar also contains the longest ingredients list, which might be a dealbreaker for people who value the simplicity of what’s contained within Luna Bars and RXBARs. Though the price points of these bars are in constant flux, the RXBAR cost almost twice as much as the other two options at the time of writing. However, you’ll get the highest protein content and lowest sugar level of any bar we looked at. These factors might make the extra charge worthwhile to you, as a higher protein content tends to keep you full longer and less sugar is, according to the AHA, better. What Do Customers Think of LARABAR? The world’s healthiest snack bar won’t do you much good if you think it tastes terrible. Will you enjoy eating LÄRABAR products? One of the best ways to decide is by seeing what other customers thought of them. Both Influenster and Amazon have hundreds of reviews listed for LÄRABAR products. Most flavor varieties have been awarded at least four stars out of five by reviewers, and many of the comments we read stated that customers enjoyed eating the bars as a quick, healthy alternative for breakfasts, snacks and even dessert. Despite their low protein content, many people shared that the bars kept them feeling full long after they ate them and that they worked well for post-workout refueling. We also noticed comments from people with food sensitivities who praised LÄRABAR products for being easy on their digestive systems. On the negative side, a few people wrote that some of the bar flavors were too strong for them, particularly regarding the cinnamon in the apple pie flavor. Others found that the bars were slimy in the packaging, and numerous Amazon reviewers noted that they received opened-box orders and even moldy bars. While taste is a personal preference, the customer reviews we looked at showed that many customers are happy with the brand, though it might take some experimentation to find a flavor you really like. Our View: Should You Try LARABAR? In light of this research, what’s our view about LÄRABAR? We think this brand of minimal-ingredient bars and snacks delivers what they promise, with the notable exception that a number of the brand’s products contain added sugars. If you’re looking for the kind of healthy snack that will keep you satisfied between meals, there’s ample reason to consider the LÄRABAR. However, if you’re looking for a meal replacement or post-workout fuel source, the bar’s 3-4 grams of protein might not be enough for you. Customer reviews show that many people appreciate the broad range of flavors that LÄRABAR provides, and many noted that if one didn’t suit them, there was a good chance another one did. Amazon reviews show that there are occasionally quality control issues with LÄRABARs, so it’s important to pay attention to each box’s expiration date. We think these bars are a smart snack option for those looking for a lighter treat, and they can be found in retail locations across the U.S. If you’re looking for a snack bar that’s slightly more substantial but doesn’t compromise on the ingredients it contains, we recommend taking a closer look at RXBARs. Write a Review for LARABAR!